Learn about history’s greatest events through eyewitness accounts using this authoritative digital resource. 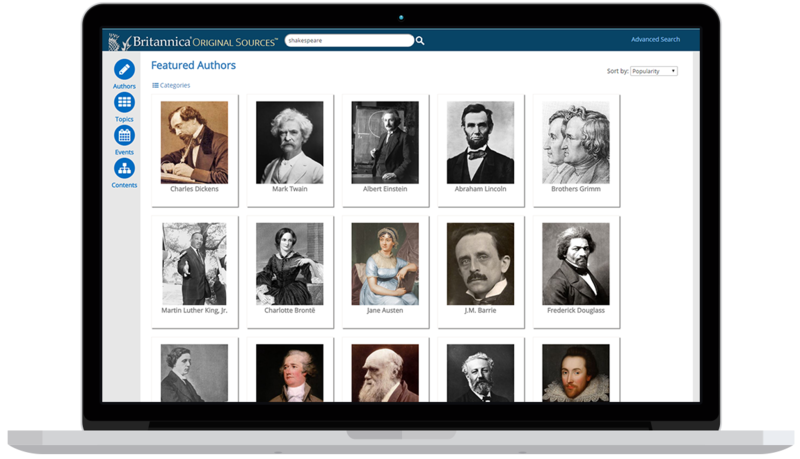 Britannica Original Sources gives students access to an extensive, continuously increasing collection of over 420,000 e-works of classic, primary source, and general reference materials. This vast collection provides the original sources and personal accounts of humankind’s social, political, legal and religious development, as well as some of the greatest discoveries, insights and literary achievements in the words of the actual authors, discoverers and knowledge-seekers. Including Marco Polo, Henry Ford, Karl Marx, Malcolm X and Winston Churchill, this authoritative resource brings subjects to life, providing children with direct access to first-hand accounts from those at the centre of events. For example, children can read Confucius, Dante and Pasteur or Thomas Jefferson’s account of the signing of the Declaration of Independence.